It’s not for nothing that the fourth season premiere of Steven Moffat and Mark Gatiss’s breakneck-paced update of the immortal Sir Arthur Conan Doyle character opens with a story about a man trying to outrun Death. We are finally witnessing the consequences of a lifetime of nasty, selfish behavior on the part of Benedict Cumberbatch’s jazzed-up dangerous mind coming home to roost — and it’s not merely Holmes who will pay the price for his misdeeds, but also everyone he’s closest to. No such luck in modern-day London. After Holmes whistles his way back to work on Moriarty’s final, posthumous “game,” the table is set for another long fall. But neither he nor we realize the extent of this bait-and-switch for quite some time, because episode director Rachel Talalay keeps diverting our attentions via red herrings. First, we get what looks like the typical unsolvable mystery, this one involving a broken bust of Margaret Thatcher and a wealthy diplomat’s deceased son, who turns up dead in a car crash in their driveway despite the fact that he was supposedly in Nepal. Sherlock solves the peculiarities of the latter easily enough — the son disguised himself as one of his car’s leather seats, hoping to surprise his father, then had a stroke and died a week before the crash — but the busted Thatcher continues to needle him. It was destroyed for seemingly no reason, and the intruder took nothing else of value. “A loose thread in the world,” Sherlock muses. It’s a disrupter of the natural order of things, an occurrence that his patented map of probable outcomes couldn’t predict. That loose thread unravels a bit more as Inspector Lestrade returns to Baker Street with more cases involving identical smashed Thatchers, which serves as the parallel for this episode’s Doyle inspiration, “The Six Napoleons.” Sherlock cunningly traces all the Thatcher busts to a single manufacturer in Tbilisi, Georgia, a move that allows him to predict where the Iron Lady Smasher will strike next — and when the two rogues corner each other, it makes for a brutal, bruising, surprisingly unstylish battle. What’s especially surprising, once we learn the culprit’s identity, is the fact that Sherlock wins their showdown. Skilled though he may be in the martial art of Bartitsu, he surely would be no match for one of Britain’s most highly sought-after ex-mercenaries, a member of the elite hit squad A.G.R.A. named Ajay (Sacha Dhawan), who had just spent six years being tortured in Tbilisi after an extraction mission went horribly wrong. While there, Ajay had hidden a flash drive filled with his group’s incriminating secrets inside one of the six Thatcher busts, and now is out to retrieve it. That’s not all: He’s also exacting his revenge on the team member he believes betrayed him … the brand-new mother Mary Watson. What? Yes. Mary’s past as a secret-agent-for-hire, first glimpsed in “His Last Vow,” here comes back into the forefront, fleshed out with colorful details (that identical-looking flash drive Watson burned at episode’s end contains enough information for any one member to incriminate any other, and Mary’s real first name is Rosamund, the same name the couple give their infant daughter). At the end of season three, it was a bit funny to realize that Mary wanted to settle down with Watson in part because he was kind and simple enough to overlook the fact that she was a trained assassin. But to realize now that figures like Ajay may have been after her the entire time suddenly makes Mary’s choice to start a family in close proximity to a world-famous detective seem almost reckless. Perhaps Sherlock’s hyperconfidence has rubbed off on Mary, who seems all too willing to believe his oft-promised vow that he would keep the Watson family safe in London for as long as they lived. Unfortunately for them all, Sherlock can’t reschedule an appointment in Samarra. It might seem they catch a lucky break when Ajay is killed during the showdown in Morocco, but then the true traitor of A.G.R.A.’s mission emerges. When disgruntled British government secretary Vivian Norbury (Marcia Warren) shoots at Sherlock during a final confrontation in the London Aquarium, Mary dives in front of the bullet, inviting Death herself. By the time we learn the truth about A.G.R.A., the episode can’t offer much in the way of grand deductions. Norbury’s identity is revealed without much fanfare, so “The Six Thatchers” isn’t so much a mystery as an emotional stew. Sherlock has finally sensed that his devil-may-care attitude is catching up with him, which is why he instructs Mrs. Hudson at episode’s end to use “Norbury” as a trigger word for him going forward. He’s learning that he has genuine affection for the Watsons that goes beyond what he feels when he solves a case, and embraces his role as little Rose’s godfather in a delightful scene where he chides “Watson” for her illogical rattle-throwing decisions. It’s fun to swap John Watson out for his wife because “she’s better than you at this sort of thing”; it’s fun to lie waiting for Mary in Morocco when she believes her random globetrotting has cut her off from all contact; it’s fun to be part of a family. All of that ends now, with Mary dead (as the Doyle canon dictated), and John, who rightfully feels Sherlock is responsible, demanding his partner never call him again. Obviously there are larger games on the horizon, as Moriarty and Mary’s two beyond-the-grave quests will battle for Sherlock’s attention in the coming episodes. Still, reclaiming the sense of pure fun that Sherlock excels at will be tough. Think about how much Watson has been through emotionally, between being led to believe for two years that his best friend was dead and now having his wife actually die in his arms thanks to that same friend’s gamesmanship. Fate is not done playing its hand. It’s a bit of a Sherlockian thing to say, but all this emotional stuff just gets in the way of the mysteries, which are, after all, the reason we’re here. “The Six Thatchers” seems to have used such heartstring tuggers to make up for the thinness of its central case, which could be why it felt more emotionally taxing and less jigsaw-giddy than the finest moments of the series. Will we find a balance with the next two episodes? Well, we’d all like to keep our appointments. Question: Should Sherlock really be tweeting? Watson is the one who reframes their case-solving narratives and crafts the vision of Holmes for public consumption, because the detective is too inept at human communication to manage the feat on his own. Having the man himself make direct interactions with the public seems uncharacteristic. 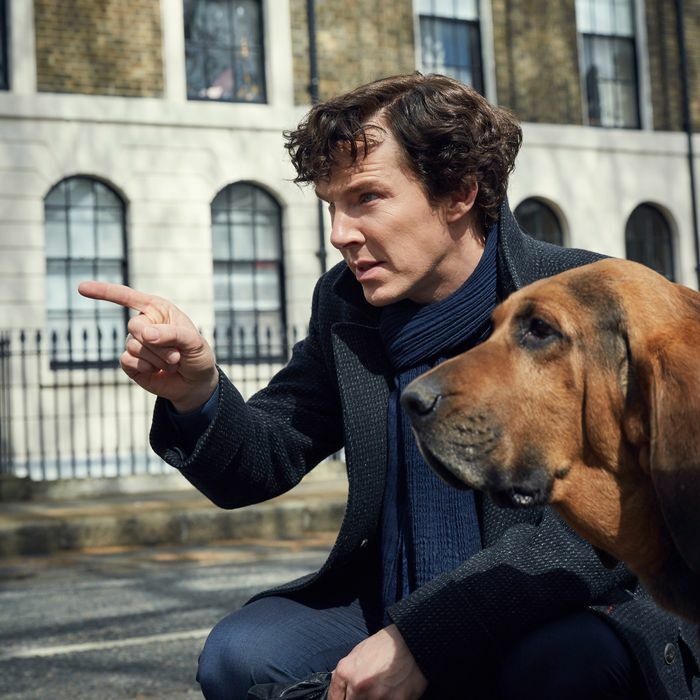 The show wisely steers clear of ascribing any political commentary to its dialogue about Thatcher — and having Sherlock not know who she is helps. My favorite oh, that Sherlock! moment: When he caught the Thatcher culprit before Ajay could smash the final bust, Holmes went ahead and smashed it himself out of sheer curiosity. Poor Watson had little to do in this episode apart from watching helplessly as his wife died. Surprisingly, Mary wound up having shared more screentime (and chemistry) with Sherlock than Watson. Holmes seems to respect her more than his longtime associate, because he always respects the people who operate at his level of intellect. Since there are no random strangers in the Sherlock universe, it stands to reason that the mystery redhead playing flirty text games with Watson will turn out to be a major player in one of the next two episodes. Although truthfully, unless we get another big time jump, it will be hard to stomach the idea of a widowed Watson moving into another relationship so quickly — despite Holmes’s diagnosis that such a desire to replace a partner is what powers all widows. A final requiem for Mary: Stephen Moffat has taken a lot of heat for his treatment of women, but I’ve been thoroughly impressed with the way Sherlock handled this character. She was sly, secretive, complicated, and a bristling force. Amanda Abbington always made clear in her performance that Mary plotted her own way through the morality of the universe, so I’m sad to see her go. Although, who knows how gone she really is?